Well after looking for a car for about... a year now, I finally took the plunge and got one. 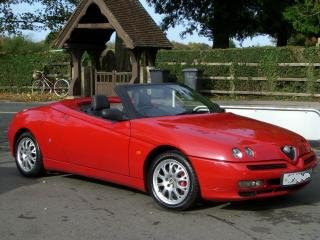 Say hello to my 2001 Alfa Romeo Spider 3.0 v6. Not bad for a first car! It does about 145mph and 0-60 in 6.5s. I reckon I will be taking it a bit easier than that though as the fuel economy is terrible. Sadly I have given up my bike insurance and transferred the NCB to the car policy, so I will probably be getting rid of the bike.